For the Star Wars planet, see Lothal (Star Wars). 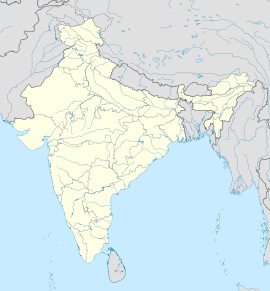 Lothal (IPA: [loˑt̪ʰəl]) is one of the southernmost cities of the ancient Indus Valley Civilization, located in the Bhāl region of the modern state of Gujarāt and first inhabited c. 3700 BCE. Discovered in 1954, Lothal was excavated from 13 February 1955 to 19 May 1960 by the Archaeological Survey of India (ASI), the official Indian government agency for the preservation of ancient monuments. According to the ASI, Lothal had the world's earliest known dock, which connected the city to an ancient course of the Sabarmati river on the trade route between Harappan cities in Sindh and the peninsula of Saurashtra when the surrounding Kutch desert of today was a part of the Arabian Sea. However, this interpretation has been challenged by other archaeologists, who argue that Lothal was a comparatively small town, and that the "dock" was actually an irrigation tank. Speculation suggests that owing to the comparatively small dimensions of the main city, Lothal was not a large settlement at all, and its "dock" was perhaps an irrigation tank. However, the ASI and other contemporary archaeologists assert that the city was a part of a major river system on the trade route of the ancient peoples from Sindh to Saurashtra in Gujarat. Lothal provides with the largest collection of antiquities in the archaeology of modern India. It is essentially a single culture site—the Harappan culture in all its variances is evidenced. An indigenous micaceous Red Ware culture also existed, which is believed to be[who?] autochthonous and pre-Harappan. Two sub-periods of Harappan culture are distinguished: the same period (between 2400 and 1900 BCE) is identical to the exuberant culture of Harappa and Mohenjo-daro. Archaeological Museum of Lothal, replica of seal. The dock, with a canal opening to allow water to flow into the river, thereby maintaining a stable water level. Remains of canal opening, built with burnt bricks. A coastal route may have existed linking sites such as Lothal and Dholavira to Sutkagan Dor on the Makran coast. ^ "Where does history begin?". ^ Leshnik, "The Harappan 'Port' at Lothal"
^ "Excavations – Important – Gujarat". Archaeological Survey of India. Retrieved 25 October 2011. ^ Robert W. Bradnock, Anil Mulchandani (2001). Rajasthan and Gujarat Handbook: The Travel Guide (PHP). Footprint Travel Guides. p. 276. ISBN 1-900949-92-X. Retrieved 26 October 2006. ^ S. R. Rao (1985). Lothal. Archaeological Survey of India. pp. 2–3. ^ a b c Leshnik, Lawrence S. (1968). "The Harappan "Port" at Lothal: Another View". American Anthropologist. 70 (5): 911–922. JSTOR 669756. ^ S. R. Rao (1985). Lothal. Archaeological Survey of India. pp. 30–31. ^ a b Khadkikar; et al. (2004). "Paleoenvironments around Lothal" (PDF). Journal of the Indian Geophysics Union (Vol. 8, No. 1). ^ S. R. Rao (1985). Lothal. Archaeological Survey of India. p. 6. ^ S. R. Rao (1985). Lothal. Archaeological Survey of India. pp. 7–8. ^ a b c d S. R. Rao (1985). Lothal. Archaeological Survey of India. pp. 11–17. ^ S. R. Rao (1985). Lothal. Archaeological Survey of India. p. 8. ^ S. R. Rao (1985). Lothal. Archaeological Survey of India. p. 12. ^ S. R. Rao (1985). Lothal. Archaeological Survey of India. p. 13. ^ S. R. Rao (1985). Lothal. Archaeological Survey of India. pp. 13–14. ^ S. R. Rao (1985). Lothal. Archaeological Survey of India. pp. 13–15. ^ S. R. Rao (1985). Lothal. Archaeological Survey of India. pp. 40–41. ^ S. R. Rao (1985). Lothal. Archaeological Survey of India. pp. 39–40. ^ S. R. Rao (1985). Lothal. Archaeological Survey of India. p. 39. ^ S. R. Rao (1985). Lothal. Archaeological Survey of India. p. 41. ^ S. R. Rao (1985). Lothal. Archaeological Survey of India. pp. 43–45. ^ S. R. Rao (1985). Lothal. Archaeological Survey of India. p. 2. ^ "India". Encyclopædia Britannica. Encyclopædia Britannica Premium Service. 2006. Retrieved 6 April 2006. ^ S. R. Rao (1985). Lothal. Archaeological Survey of India. p. 45. ^ a b S. R. Rao (1985). Lothal. Archaeological Survey of India. p. 42. ^ S. R. Rao (1985). Lothal. Archaeological Survey of India. pp. 41–42. ^ a b S. R. Rao (1985). Lothal. Archaeological Survey of India. p. 43. ^ a b S. R. Rao (1985). Lothal. Archaeological Survey of India. pp. 33–34. ^ S. R. Rao (1985). Lothal. Archaeological Survey of India. pp. 31–33. ^ S. R. Rao (1985). Lothal. Archaeological Survey of India. pp. 35–36. ^ S. R. Rao (1985). Lothal. Archaeological Survey of India. pp. 45–47. ^ a b S. R. Rao (1985). Lothal. Archaeological Survey of India. p. 46. ^ S. R. Rao (1985). Lothal. Archaeological Survey of India. pp. 47–48. ^ "Excavation Sites in Gujarat - Archaeological Survey of India". asi.nic.in. Retrieved 1 June 2018. ^ "Ancient Lothal crumbling under modern neglect". Indian Express. India. 14 December 1998. Archived from the original on 19 September 2003. ^ Janyala Sreenivas. "Harappan mound needs the kiss of life". The Indian Express. Archived from the original on 27 February 2009. Retrieved 27 October 2006. ^ a b S. R. Rao (1985). Lothal. Archaeological Survey of India. pp. 28–29. ^ S. R. Rao (1985). Lothal. Archaeological Survey of India. pp. 17–18. ^ S. R. Rao (1985). Lothal. Archaeological Survey of India. pp. 19–21. ^ S. R. Rao (1985). Lothal. Archaeological Survey of India. pp. 23–24. ^ S. R. Rao (1985). Lothal. Archaeological Survey of India. p. 23. ^ Singh, Upinder (2008). A History of Ancient and Early Medieval India : from the Stone Age to the 12th century. New Delhi: Pearson Education. p. 167. ISBN 9788131711200. Harappa Town Planning" (published in "Uttar Pradesh" in November 1961). Wikimedia Commons has media related to Lothal.